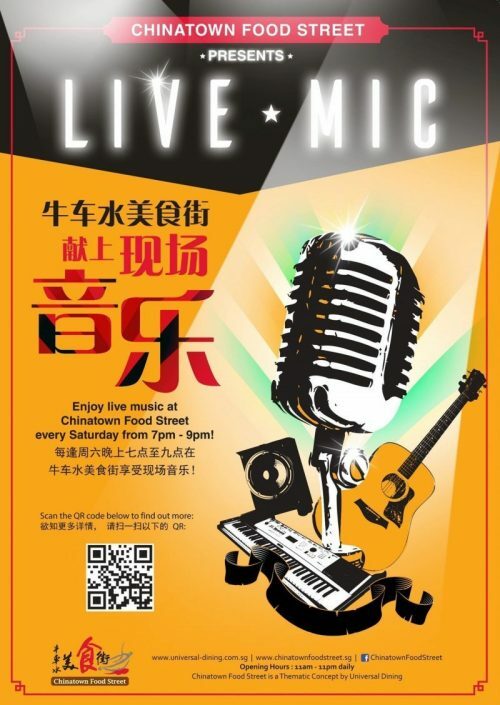 Every Saturday from 7pm – 9pm head to CFS to enjoy live music while you feast on delicious street hawker fare! This Lunar New Year, Chinatown Food Street (CFS) ushers in an auspicious year of the dog with art! With the aim of bringing art – a centuries-old component of the Chinese culture to the forefront, CFS will be unveiling a participatory art canvas along the bustling hawker street on 20 January 2018. This participatory art canvas welcomes all visitors to play a role in shaping the vibrant art piece envisioned. Visitors will be able to freely express themselves and decorate the canvas with the heart-shaped stickers provided. With each heart representing their well-wishes to a loved one, this family-friendly activity allows both the young and old, to participate in this customary Chinese tradition of conveying your well-wishes to loved ones during the Lunar New Year with a sticky twist! The art canvas will be on exhibit at CFS from 20 January to 28 February 2018. 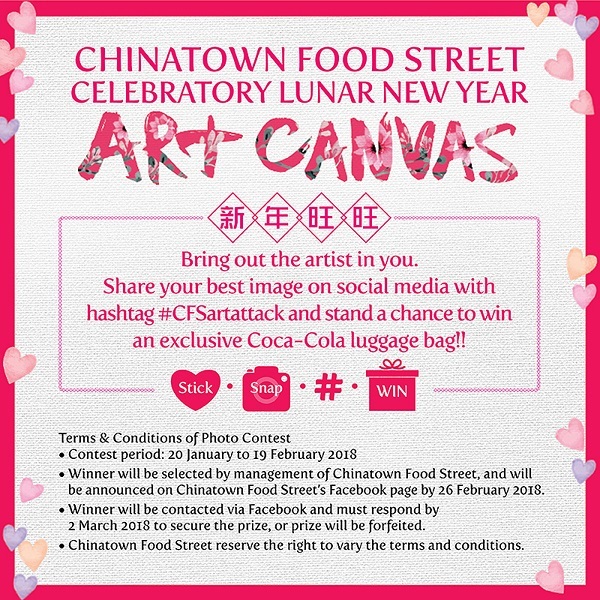 To add to the joyous spring festival, CFS will be giving out an exclusive Coca-Cola luggage bag to one lucky winner of a snap and win contest! To participate, visitors will simply have to snap a picture with the canvas and upload the image with the official hashtag #CFSartattack on social media to stand a chance to win. Contest closes on 19 February 2018, 11.59pm. The lucky winner will be announced on CFS’s Facebook page by 26 February 2018. Celebrate a Bountiful Lunar New Year at Chinatown Food Street!